I find this response pretty abrasive and heartless. To put things into perspective; Taz should be close to 20 lbs, and 30 inches in length. So the fact that he is less than 14 lbs, and 26 inches in length is significant, and attributable to his celiac. His is the most dramatic case his doctor has ever seen. Really? I always thought the Pentecostal snake handlers got their justification from Mark 16:18 not the Tone 7 Dogmatic Theotokion. This has been a sore subject with me for a while, and I'm really struggling, so I feel your pain. I have Celiac, Eosiniphilic Esophagitis, and Lupus. Gluten is a serious problem for me, it can cause very real health problems which go beyond the symptoms of Celiac Disease. Talk to your priest, my priest gives me a tiny bit when I go up for communion, but even a tiny bit can hurt, so I don't approach the chalice often. I know that in some cases, the Priest gets permission to just give wine, and in others, they have a separate chalice all together for someone with Celiac. It's very very hard to deal with. I hope that you find the answers you need. It's hard because people don't take Celiac seriously, it's an extremely serious problem. Says nothing about diminishing the properties of wheat in the Eucharist. Fellow Orthodox celiac here. When I converted, I was concerned about how my body would handle the Eucharist, as even the smallest amount of gluten will make me sick. Miraculously, in my case, I found that it does not make me ill. However, that's not the case for all Orthodox celiacs. If it does make you sick, the priest can make special preparations for you. I know one priest who would set aside the wine before the bread went in it and would serve that to the celiac. Talk to your priest; I'm sure something can be arranged. I'm glad it occurred to me to open this forum again and find others dealing with this. Welcome, Quinault. I'm sorry to hear of your problems with your son. But thank you for confirming what I know to be reality. Frankly, the difficulty of living in full communion with the church, in its primary liturgical celebration, is what is keeping me from Orthodoxy. There is a wonderful church full of converts I attend now and then. The Bible lessons are fascinating, and I love the Eucharistic celebration. But as it is now, I couldn't participate. The pastor, the one who gives such vivid and enlightening Bible studies, when asked about celiac parishioners, had this to say: "The body and blood of Jesus Christ could not possibly do any harm." This is real. We are not imagining things, nor being hypochondriacs. The main problem is, every exposure to gluten causes damage to one's intestines. Enough damage and you could get colon cancer. My mother died of colon cancer at age 64. I am age 60. True, I could decide to stick around and educate people, but that's wearing. I'm an introvert, not a natural-born trailblazer. I'd be embarrassed to have a special fuss made for me -- to change things that radically, to change a church famed for its changelessness. Look in this thread, at all the people who nonchalantly assured the original poster and others that their problem didn't really exist. The implication given, of course, is that it wouldn't exist IF the celiac patients were sincere and had enough faith -- the kind of faith that, of course, they, the responders, had. The questioner's belief in their supposed problem was seen as a reflection on them. That kind of hyperspiritual one-upmanship is what I am afraid of. No, sorry, I've been behind that Pentecostal 8-ball enough times. I've been advised to just plunge in and trust the priest, but the common lack of awareness and especially lack of belief in (respect of?) the importance of this, makes such trust a gamble. How careful was Baruch's mother's priest with her? It is confusing, isn't it? Like ebailey, "I find it profoundly upsetting to ask these questions of people who don't know much about Celiac disease, and react with horror at my asking, as if I don't believe that the Mysteries are the true Body and Blood as well as bread and wine." But they are both, aren't they? It seems that, in practice, Orthodoxy's interpretation of the communion mystery is much more rigid than the supposedly overly-scholastic thinking of Catholicism. Elizabeth, I couldn't have said it better myself. This is exactly how I feel! It's really very hard, so thank you for posting! .... True, I could decide to stick around and educate people, but that's wearing. I'm an introvert, not a natural-born trailblazer. I'd be embarrassed to have a special fuss made for me -- to change things that radically, to change a church famed for its changelessness. The Church practices economy such that she can minister to people with celiac disease. If your Priest doesn't get it, try the Bishop. Chances are that the Bishop has allowed other communities to commune people with celiac disease from separate chalices. I still stand by the statement that Holy Communion is harmless except, as an act of contrition and economy, acknowledge that the gluten present in the bread can cause harm. It seems that, in practice, Orthodoxy's interpretation of the communion mystery is much more rigid than the supposedly overly-scholastic thinking of Catholicism. Are there other Orthodox practices that you find more rigid than Catholicism? Tazzy has been on prescription formula now for 3 months. He is up to 17 pounds in weight, and 28 inches in length He is consuming about 2k calories a day, and has flatlined in weight gain for the last 2 months. It seems his digestive system is still healing. Hopefully soon his system will be fully healed. But for now, he is still on a strict GF diet. I still struggle a great deal with the issue of communion. Because he can't tell me how he feels, I don't know how much the gluten in communion sparks a reaction. This leaves me with a profound sense of guilt. If I commune him and he reacts, but can't tell me I am essentially harming him. If I don't commune him, I am keeping him from an essential "food." One of the issues with celiac disease and gluten intolerance is that reactions vary widely from person to person and encounter to encounter. Here's a thought; in theory, if the faith of an infant is confirmed through the proclamation of a sponsor/godparent in Orthodoxy, then can't the godparent also receive the Eucharist on behalf of a person with celiac disease? Say, every Sunday, the godparent receives the Eucharist twice; once for himself, and once for the godchild. No. The godparent and the godchild do not share the same hypostasis. Sacraments are for hypostases. Hmm. Well, if both of them have been united through Christ in Baptism, then technically can't it be argued that they do share the same hypostasis through their unity to Christ? Well, it seems like the only option is for the person to not receive the Eucharist until their deathbed. Here is a pretty clear visual on how bad his celiac disease was/is. Top photo is a few days before he went fully GF, bottom 3 months off gluten, he went from 13 lbs in the top photo, to 17 in the bottom. What a cheerful, beautiful, happy baby guy you have! This article says that your faith makes all the difference, and so do many other sources I am finding. I would be curious to find out more about this issue. "There is nothing wrong with having 'Blood Only' Communion for justified reasons - I believe that it is given that way to the infants who are still unable to swallow solid food. And - maybe the other posters can discuss this in a bit more detail - have you considered a leap of faith? Remember, thousands and thousands of Eastern Orthodox approach the Holy Chalice and yet you won't see our parishes ridden with disease (we take Communion out of the same spoon). There is also the story about St. John of Shangai who took a piece of Communion vomited by a woman who had rabbies - he suffered no ill effects. However, seeing how you may probably not be willing to experiment with it, ask those who say that it is impossible to administer the Eucharist separately - is it better for you to recieve the Holy Blood (at least) or to go through your entire life without Communion?" You do realize that Celiac Disease is not communicable, right? Celiac is an autoimmune reaction to gluten. It isn't something one catches like a virus. It is the body attacking itself when it encounters gluten. The closest condition would be an allergic reaction. But even that isn't a good comparison since one can *counteract* an allergic reaction. You can't counteract a celiac reaction to gluten. 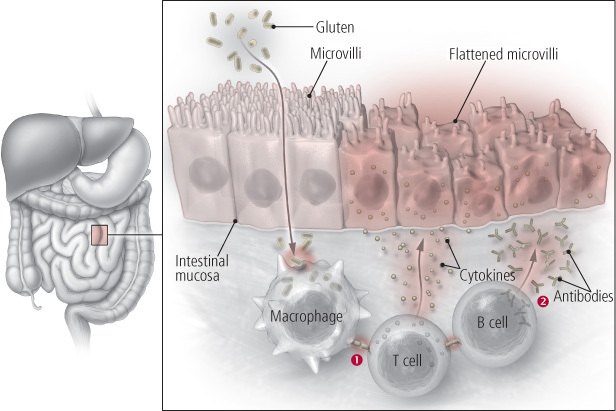 When people with celiac disease eat foods that contain gluten, gluten proteins permeate the wall of the small intestine and are taken up by immune cells called macrophages, which digest them and send a signal to other immune cells called T cells (1). In response, T cells emit chemicals called cytokines that trigger inflammation and also notify B cells, another group of immune cells, to produce antibodies to gluten (2). As the immune system wages war against gluten, the intestinal villi and microvilli suffer collateral damage. The villi become eroded and flatten, which leaves the small intestine less capable of absorbing nutrients. The result is diarrhea and a host of health problems related to malnutrition, including weight loss, anemia, and osteoporosis. Or in my son's case; you slowly starve to death until you are completely gluten free despite consuming massive amounts of calories per day. My previous posts were in regards to setting aside Communion (Blood Only) for those who are very ill, as well as how faith has caused many people to not be affected by Communion (with the examples above) and this can also be true for people with celiac disease. I have even heard of people with celiac disease who were not affected by Communion, but as soon as they tried something else with bread, they got sick. Each must analyze his own faith and circumstances. As the person was saying in the comment, for some baby steps may be necessary, if your parish allows. Personally, I always get scared when I hear people could get sick, so I recommend taking a step back to analyze the situation. As the person was saying in the comment, for some baby steps may be necessary, if your parish allows. Um, especially when we are talking about an actual BABY! Sorry, to ruin the truth that indeed babies are babies and they deserve very special care, but the faith of the parents can influence the state of the baby. God does allow the sins of the parents to affect children and a baby is not in charge of himself. Not accusing, not judging, just describing the law of causality. If you take your baby to communion for the wrong reasons or according to a heretical faith, he may suffer the consequences of your own choice. The opposite would be for God to allow the child to experience a wrong path as if it is the truth. Not only that, sorry to have to say, it can be the joint sins of the entire parish, or even diocese, etc., who may cause such problems. It would actually be good news for you because you wouldn't want the mysteries to work, if they are treated as rules or laws, or in a very superficial manner, etc. That would be the equivalent of eating from the Tree of Life after eating from the Tree of Knowledge of Good and Evil at the wrong time. God only knows why He would allow certain things. What a beautiful, precious baby. Wow. This is rather stunning. It seems I was reading attitudes correctly. Unfortunately. Thank you for pointing out this article. Even after many searches, I'd not found it until your post. It rather makes up my mind for me. "Your faith makes all the difference." That's putting this squarely in the school of pentecostalism. Sorry, I've been down that road. Someone mentioned snake-handlers, and it fits. How easy (cheap, really) for someone who does not have celiac disease to happily carve out a faith-test for other people. And if it doesn't work, tell them -- subtly, or bluntly, as is done here -- that they are at fault. It's like telling a diabetic that if they really had enough faith, they would not need insulin. If they asked the Lord in sincerity to heal them, and had enough faith, they can count on being healed. Which, by the way, I've seen happen. Her name was Connie. Beautiful, gentle, in her 30s, her only flaw was that she was too trusting. Under the influence of preachers like Kenneth Copeland and Kenneth Hagin, and under the secret tutelage of a church elder, she stopped taking her insulin. A few days later she died. "Ordinarily, God acts ordinarily." That's why we go to doctors. Miracles are called miracles because they are instances of God bending his laws of nature, which doesn't happen willy-nilly and for no reason. If this is true -- if God would not allow a person with sufficient virtue and faith to be sickened by the Eucharist; if God can be counted on to step in and micromanage things like this, especially when they involve the faith -- it would never be heard of that a baby drowned during baptism. I won't be involved in this. Sorry, while I agree that simply telling someone in cold terms that they are at fault is not loving and considerate, that's not how I see that article and this situation. If you do not believe that the Eucharist is the actual Blood and Body of Christ and that you need to be prepared for receiving it according to His demands, then you are not ready for it, and it will probably harm you. Christ always says that sin is the cause of death and not Himself, nor us (He does not say we are guilty, only responsible for our state). Let us not confuse Orthodox faith with auto-suggestion, or protestant faith etc. Faith doesn't mean that God saves you regardless of what you do, or even if you believe that "you are saved" (that everything is working by itself). The Truth is that God indeed helps as gift, through His Grace, not our own powers, but only in the measure that you prepare yourself, you co-operate with His Way. I hope that when you say you won't be involved in this, you don't mean Orthodoxy. That article is one priest's opinion and obviously, you will find others that support that position, it is certainly not dogma. I don't see any basis for saying that the gluten leaves the mystery any more than you can say that we can run a DNA test and get Jesus' DNA from it. Thank you. We love him a great deal. He is an awesome little fellow. Growing up with Pentecostal parents that didn't believe in modern medicine, I experienced first hand how the "faith" of the parents can injure the child. My step father took me riding on a motorcycle when I was around 4. At some point he stopped, I was off the motorcycle and wanted to climb on. He wasn't paying attention and the motorcycle fell on top of me. The engine was really hot. I ended up with a third degree burn across my entire stomach. It burned thru my swimming suit and covered the middle third of my body. As the child of an American Indian, I had access to free medical care thru the BIA, additionally my father paid for a private insurance plan. My mother should have taken me to the doctor. I should have had skin grafts, antibiotics and medical treatment. Instead, they "treated" my burn with prayer, vitamin E oil, tea treat oil, and aloe vera. I have a horrific scar across my stomach. The fact that I didn't end up with an infection is a miracle. As a 4 year old child I had no choice in the matter. I didn't have medical care because my parents didn't think that modern medicine was "good." So I suffered thru months of "treatment" at home instead. My faith, or lack thereof has little to do with my son taking communion. My responsibility as a parent is to take care of my child, and to keep him from harm. If an adult celiac chooses to partake of communion believing that it can't harm them, then they certainly can choose to do so. My son is incapable of making that choice/decision. I have to make that decision for him. That is a decision I don't take lightly. I don't think it should be something decided upon "faith" alone. I know just how damaging that can be first hand. If you do not believe that the Eucharist is the actual Blood and Body of Christ and that you need to be prepared for receiving it according to His demands, then you are not ready for it, and it will probably harm you. Christ always says that sin is the cause of death and not Himself, nor us (He does not say we are guilty, only responsible for our state). If anyone can accept the Eucharist properly prepared it is a 1 year old. And if you are implying that my son would be injured by the gluten in the Eucharist because *I* am not prepared...well you need to explain your logic to me. To look at it from another perspective. If someone somehow secretly mixed rat poison in the mysteries or poisoned them before they are concecrated. Could someone be miraculously spared from death in that situation? Absolutely, but I don't think God is somehow "obligated" to make sure that no one would die from such a situation. If anyone can accept the Eucharist properly prepared it is a 1 year old. I have actually talked about the parents not being prepared in a different comment. You seem to be overly concerned with your physical state and comfort in this world (and that of your child), while Christ asks total denial of self and taking up of the cross. This seems like insanity to the world, but it is exactly what saves us from this world and ultimately from death (which needs to be killed). Otherwise, if our mysteries mean that little and they are open to any rationalities and reasons we can come up with, what is even the point of doing them? If God is not present in them, then they are useless. If it is left to up to our own interpretation of them, then again, we can save ourselves by this logic. They are the Body and Blood of Christ and they cannot harm, but our correct faith is needed through all that The Holy Fathers prescribe: fasting, repentance, confession, good deeds, etc. No, but if I did, with God's help I'd made sure I'd be very prepared for Communion, as well as not approach it without fear and reverence (as in questioning or altering it). This would affect me and my children. It is more useful for you to die trying, then to continously run away from it thinking that you will be able to do it forever. OK then. I truly hope you are never in the situation that I am in. But I am positive that if you were, you would understand it isn't as simple as you believe it to be right now. Like I said, you can do baby steps. Take one half, and then one day take the other when you are ready for that step. Remember, one half means you are half-saved. There is a statement without any basis in Orthodox theology. What really has no basis is that Communion can harm and that you should take half of it. It's no shame whatsoever though to take one half. Better to be safe and honest, than to be sorry or proud. I just hope it's any good. There is no such thing as "half saved," as Orthodox Christians we aren't "saved" we are being saved. Normally I would have the patience for this. Today I have none. Judging my faith as being less than yours because I have concern for my son...well I am not going to answer that. Let's just say that it sounds great in theory to you where you sit. In practice where I sit watching a 1 year old starve to death and scream in pain isn't as "simple" as you make it out to be. I am sure you will blame it on my lack of faith. Again; that is an easy judgement to make on the other side of the world using your keyboard. We aren't discussing theoretical issues here. We are discussing a real living, breathing person. A person that has been given to me by God to raise. If God didn't think I had the ability to raise a child with Celiac disease, I suspect that I would not have one. I truly hope you don't have to raise a child with severe life threatening celiac disease. Not as a judgement of you based on this thread, but because it is not as easy a burden to carry as you seem to believe. Most people are diagnosed Celiac into adulthood. Or at the very least after they are communicative. My son has had this since *birth* which is exceedingly rare.